For most people the Department of Work and Pensions means one thing, job centres. I work in quite a specialised area that few people would recognise, I'm a Local Service Fraud Investigator based at Bodmin Jobcentre, Cornwall. I have done this job in its various guises over 17 years. 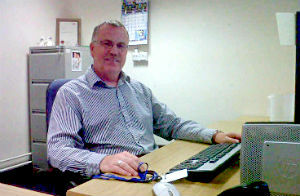 I started in the Department for Health and Social Security back in 1987 as a Clerical Officer assessing Supplementary Benefit claims. I then worked for 5 years as an Internal Security Specialist at Income Support. Here we put controls in place to ensure the way we worked was not compromised by security breaches. I've since joined the Fraud team, which expanded this year to incorporate local authority investigators to become the Single Fraud Investigation Service. This has been the most interesting job I've ever done and has given me a wealth of different experiences. When I started we dealt primarily with Instrument of Payment fraud where order books or Girocheques were stolen or manipulated. As a department we have now moved to a system of making payments made directly into claimants bank accounts. This has changed the ways fraud can be committed as people do not always have to attend offices to receive their benefit. For example I've had several cases where people have moved away from the UK without telling the department. Their benefit continues to be paid. My job involves looking at a wide range benefits and credits administered by the department, the Local Authority and HMRC. One of the most intense investigations we carry out are those around Disability Living Allowance. Often we're investigating allegations claimants are more mobile than they they claim. We look into the lifestyles of the person, such as gym membership to enable us to check whether they're entitled to the benefit they claim. We can also gather further evidence by requesting copies of bank statements and undertaking surveillance. In this case this would mean watching the claimant, waiting for them to run or go the gym, and jumping into action the moment something happens. This can be one of the best parts of the job. It's exciting and can be tense, and having a good team with you is essential. The camaraderie of the team is probably one of the best aspect of the role. We can interview suspects under caution, in the same as the Police. This has to be done well and you have to be prepared for every eventuality. Some of the excuses given during the interviews can be funny or even amazing. You just never know what you will get. If you try to judge people’s reactions it never seems to work. The people you expect to be aggressive are quite often not so, whereas the expected quieter ones sometimes seem to erupt. After interviews we send details to the Decision Making team for assessment of overpayments. When we know the scale of the fraud we can then consider whether the person can be prosecuted or another punishment applies. At all stages of an enquiry we have to be mindful of legislation as we could be called to account for this in the witness box in a Court hearing. On a daily basis I review my investigations to ensure there are no delays and to ensure swift justice. This also reduces any potential losses to the taxpayer by early intervention on cases. There are frustrations about the structure of our jobs. There always seem to be several tiers of administration but on the whole the Civil Service provides an umbrella of support for the work we do. It's not glamorous but I feel we do a necessary job that ensures benefits, wherever possible, are given to those that need it. What happened to that old adage of innocent until proven guilty..!!!!? You could actually sue for corporate manslaughter. Its a criminal offence under HA1997 to do this. These people are not trained either legally or otherwise. Its a disgrace. 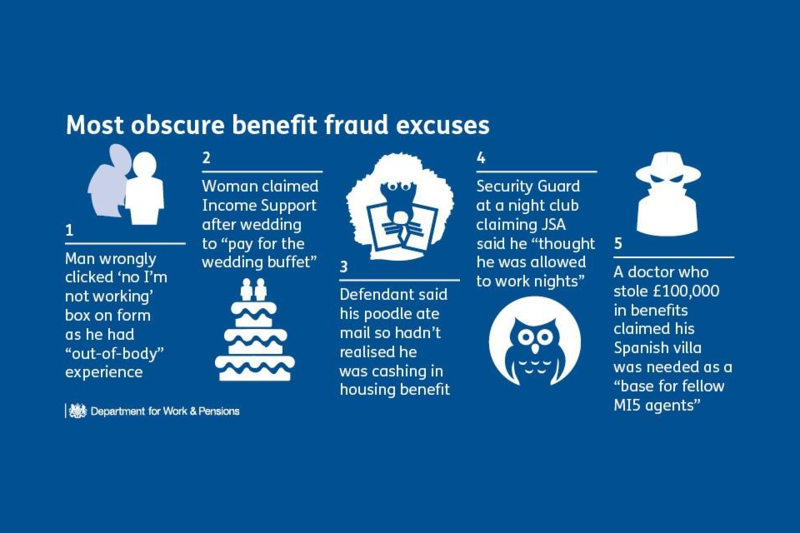 What happens when a fraud investigator has commited benefit fraud themselves ? If any person within the DWP put's forward a report to the Decision maker knowing it to be untrue and that means by both interviewing officers if interviewed, even if only one of the officers sign any report etc, then under the Fraud act 2006 the officers would be committing an offence of FRAUD BY FALSE REPRESENTATION . This act also covers " any person making it knows that it IS, OR MIGHT BE UNTRUE or worst still MISLEADS . Further to this any aforementioned employee/s can be held financially accountable for any loss. 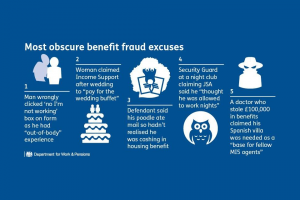 I have actually reported someone for benefit fraud who works for the dwp and does cleaning on the side (commiting benefit fraud as well as tax evasion), this was over a year ago and no action has so far been taken. Do you know who I would then escalate this to in this circumstance? I have reported using the usual means but nothing has been done.